Western North Carolina is a land of waterfalls. 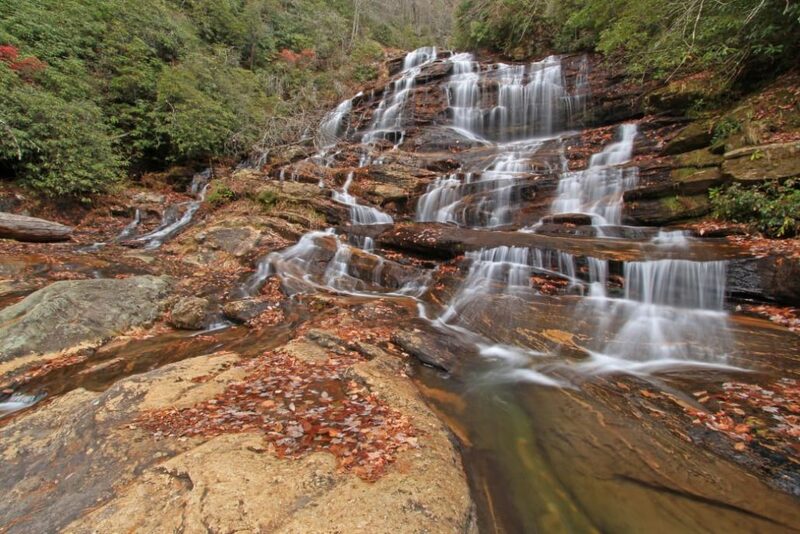 Countless cascades punctuate the waterways braiding the vast expanses of forest and lofty Appalachian peaks dominating the western corner of the state, lending the landscape an undeniably enchanting quality. Some of the falls are accessible only after delving into wild pockets of backcountry, while others are just steps from the state’s tree-lined byways. With the abundance of waterfalls, narrowing down a short list is a formidable of challenge, but these are among the most stunning cascades adorning the western part of the state. Located just outside the town of Cashiers, in the Nantahala National Forest, Whitewater Falls is one of the most awe-inspiring cascades in waterfall-laden western North Carolina—and it has the notable distinction of being the loftiest waterfall east of the Rocky Mountains. The mighty cascade announces itself in rushing roar audible from the trailhead for the half-mile path to the overlook for the 411-foot waterfall. A second, lower view platform, accessible after a descending a steep set of stairs, provides another perspective of the falls, highlighting the sheer scope of the towering flume. Schoolhouse Falls are accessible via a 1.4-mile hike. 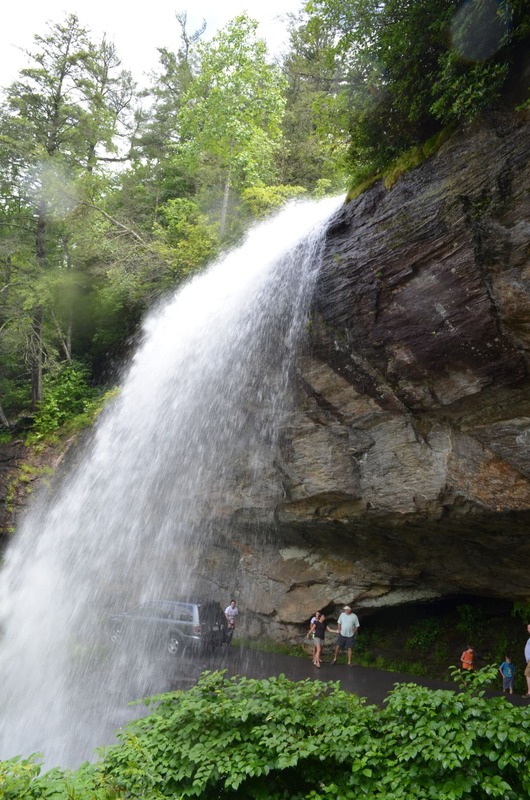 Schoolhouse Falls is located in a stunningly wild corner of the Nantahala National Forest known as Panthertown Valley. Even though the hike is fairly brief, stumbling upon Schoolhouse Falls feels like a foray deep into the backcountry. The 25-foot waterfall spills in a broad flume, pouring into a tannin-tainted plunge pool turned swimming hole during spring and summer. 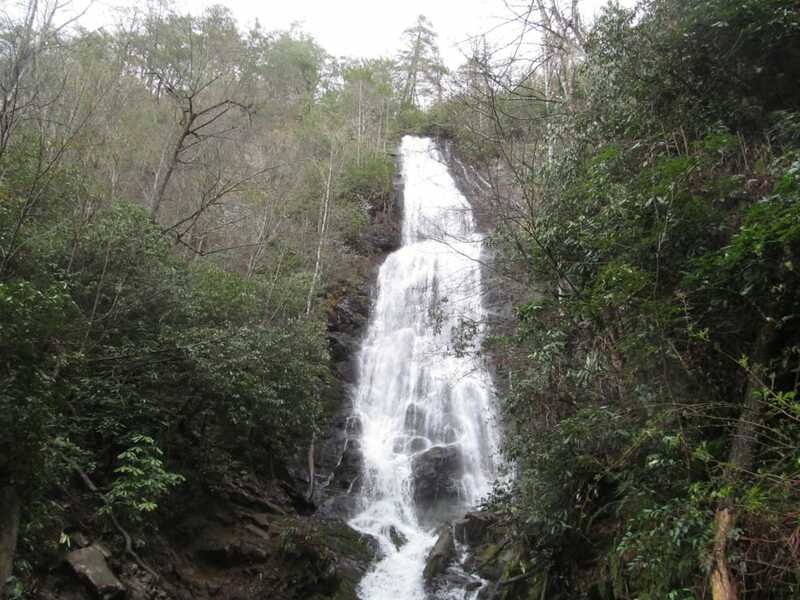 The falls are accessible along the Panthertown Valley Trail via a 1.4-mile hike from either the Cold Mountain trailhead, on the eastern side of Panthertown Valley, or a 2.4-mile hike from the Salt Rock Gap trailhead, on the western edge. Be sure to be prepared for the rugged hiking in the area with a reliable map. Silver Run Falls is near the town of Cashiers. South of the town of Cashiers, in the Nantahala National Forest, Silver Run Falls is a popular summer retreat. Compared to some of western North Carolina’s lofty cascades, the 25-foot drop of Silver Run Falls may sound uninspiring. But the broadly spread wall of water spills into an idyllic swimming hole that’s bordered by sizeable stepping stones, providing a unique access to view the falls. 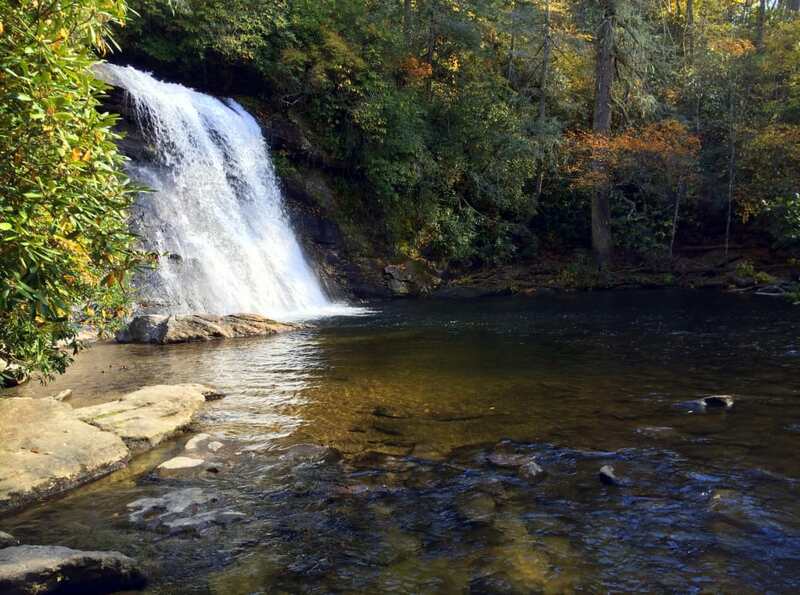 The trek to Silver Run is equally restorative—the falls are accessible courtesy of a quarter-mile trail beginning along North Carolina Highway 107. Mingo Falls descends 120 feet in a narrow cascade. Just outside the boundary of the Great Smoky Mountains National Park within the confines of the Qualla Boundary (and not far from the town of Cherokee), Mingo Falls is a thin but lofty flume. The nearly 120-foot cascade consists of a series of slender strands of water, all of which funnel together just before tumbling into a pint-sized pool in Mingo Creek. The falls are accessible courtesy of a brief but stair-filled climb of about a half a mile to a footbridge at the base of the cascade, accessible from a trailhead located on Big Cove Road. A tiered trio of cascades, Glen Falls tumbles over a broad, rocky section of the east fork of aptly named Overflow Creek, which is located in the Nantahala National Forest just outside the town of Highlands. A scenic but strenuous round-trip hike of about 2 miles on the Glen Falls Trail leads to the collection of cascades, with views of Blue Valley early in the trip. The top tier of the falls, which tumbles nearly 70-feet, is visible from an observation area just half a mile down the trail, and the second significant portion of a falls, a wide, 60-foot flume, appears another quarter mile down the trail. The 60-foot Rufus Morgan Falls is located just outside the town of Franklin. Tucked away in a wooded cove in the Nantahala National Forest just a few miles outside the town of Franklin, Rufus Morgan Falls seems much farther removed from any traces of civilization. The 60-foot partially rhododendron-shrouded flume falls flatly over a craggy cliff face and seems to tumble almost unexpectedly out of the thickly grown forest. Despite the isolated feel, the falls are easily accessible after a leisurely, half-mile hike on the Rufus Morgan Trail. These three waterfalls are In a southern corner of the Great Smoky Mountains National Park, not far from the Deep Creek entrance. Tom’s Branch and Indian Creek Falls are easily linked on a brief out-and-back hike. 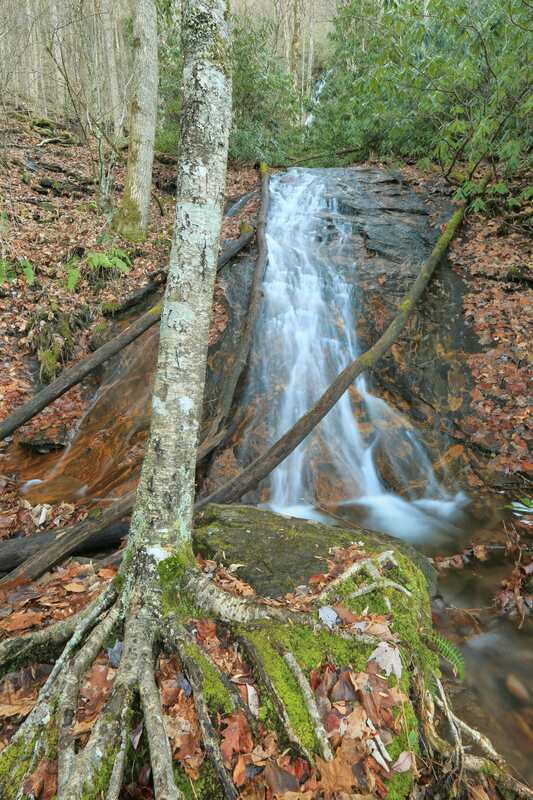 Tom’s Branch, the loftier of two flumes, falls 60-feet, stair stepping a weathered rock face. It will emerge after only about a half a mile hike on the Deep Creek Trail, one of the first pathways in the national park constructed by the Civilian Conservation Corps during the 1930s. Barely a quarter of a mile later, after the junction the Indian Creek Trail, the second cascade appears—the 25-foot Indian Creek Falls. After taking in the first two falls, tack on a trip of Juney Whank Falls. The trailhead for the Juney Whank Trail is also located in the Deep Creek area of the park, adjacent to the starting point for the Deep Creek Trail. Juney Whank Falls, a slender shimmering ribboning falling for nearly 90-feet in two distinct sections, appears after just half a mile on the Juney Whank Falls Trail. Bridal Veil Falls is outside of Highlands, N.C.
Just a couple miles outside Highlands, Bridal Veil Falls is one of the few waterfalls in western North Carolina visitors can drive to—and even behind. 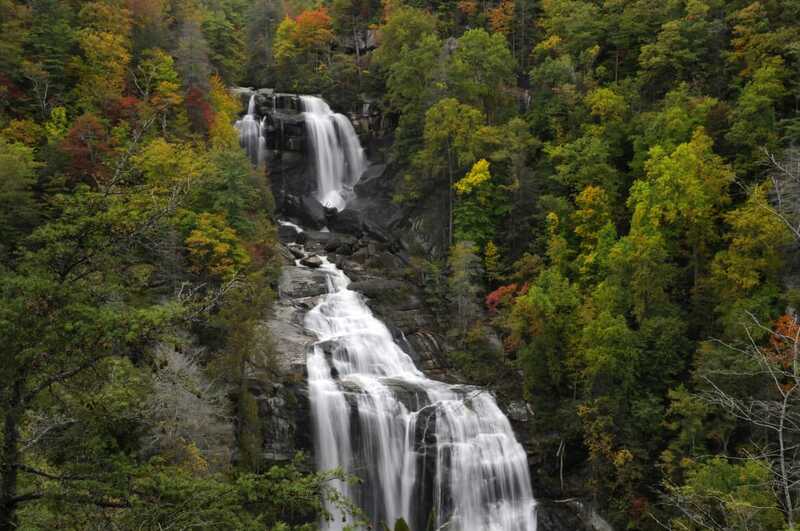 The cascade is accessible directly from U.S. Highway 64 along a stretch North Carolina’s 98-mile Waterfall Byway. Created by a drop in the Cullasaja River, the falls thin out while spilling over a prominent rock ledge, which juts out far enough people—and even vehicles—to perch behind the plunging flume and admire the tumbling water from underneath. A note on safety: Heed posted warning signs indicating danger and stay on established trails. Never climb on or around waterfalls and never play in the water above a waterfall. Rocks can be slippery and it’s easy to lose your balance especially with bare feet. Currents near waterfalls can be extremely swift even in areas further upstream. Never jump off waterfalls or dive into plunge pools at the base of waterfalls. Rocks and logs can be hidden beneath the surface of the water. 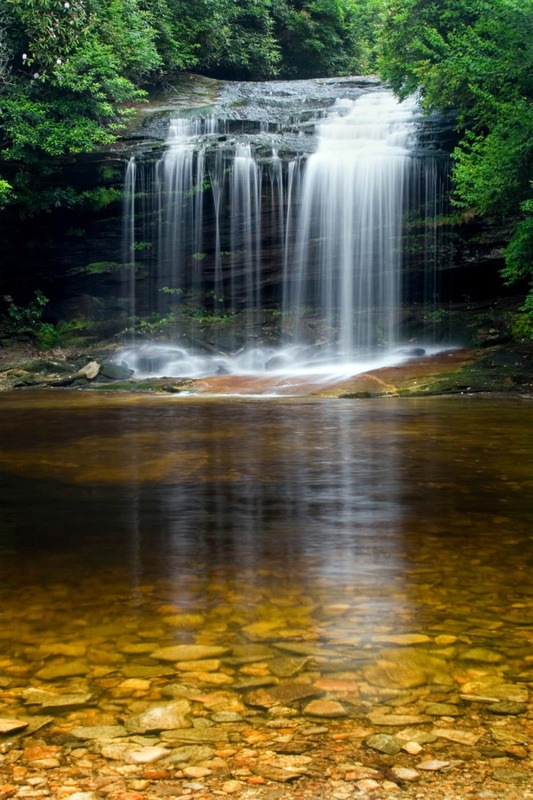 Often waterfall pools have swirling water or currents that can drag and keep you underwater. Even if you have seen other people enjoy playing around waterfalls, be aware they have been lucky to escape unharmed. Waterfalls are constantly changing with varying water flows and erosion of the rocks around them. The current from one place to the next may be faster than you anticipate and the arrangement of rocks or other debris such as logs in the plunge pool is ever-changing.